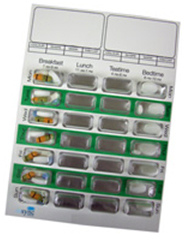 Are you having difficulty with your medication, maybe you forget to take them, maybe you find it hard to get them out of the blister packs. You may be a carer or a relative that’s noticed that a neighbour or a client or indeed a relative is struggling with their medication. Well help is at hand, we can have a chat with the patient to assess the problems their having and then see what help we can offer as a pharmacy to improve and promote safe and independent medicine taking. We may have to make the labels bigger so that the patient can read the instructions. In some cases we may need to speak to your GP about simplifying the medicine regime i.e twice a day instead of four times a day. You may need non clic cloc containers because your arthritis prevents you opening the bottles. You may need a reminder chart to aid your memory as to when you take your medicines. You may need a specially prepared dossette box that we fill for you on a weekly basis . Rest assured whatever your needs we will work hard to ensure that your medicine taking is easier, safer and monitored.